NOTE: Our guest this week is an experienced paddle-boarder and swimmer with an understanding of sea conditions. If you don’t consider yourself ‘experienced’ but want to see these sights, search online for guided paddleboard, kayak or boat tours instead. Whichever option you choose, these amazing pics will leave you wanting for more! Hi, I’m Jamie and this is our adventure. For a completely different way to explore the Causeway Coast, get yourself in the water. It’s the best, least-touristy way and there’s so much more to see too. On this particular adventure Rachel (my partner) and I went for something a bit different. 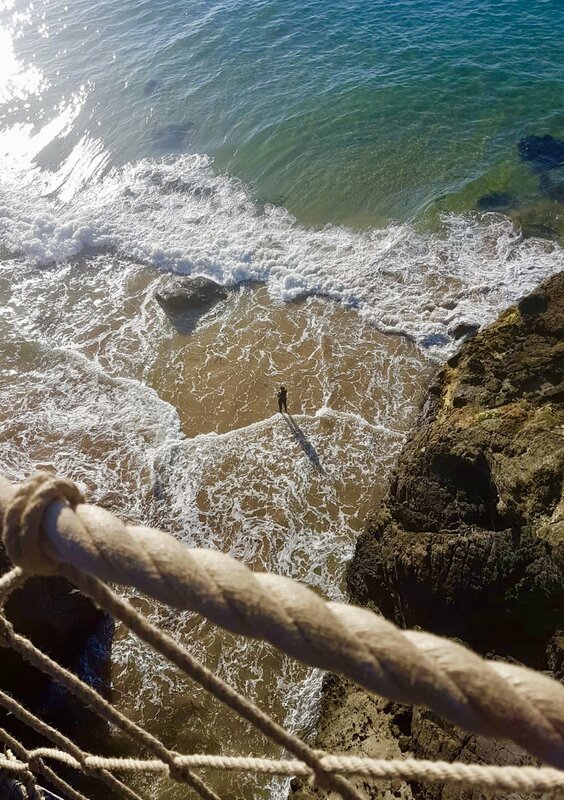 We’ve been used to seeing the same (great) pictures of the Rope Bridge…but all from roughly the same angle. So we decided to do something different, for a fresh perspective of Northern Ireland’s famous bridge. If you’re reading this and you fancy checking out the bridge by road (and on foot), head to Northern Ireland’s Causeway Coast. 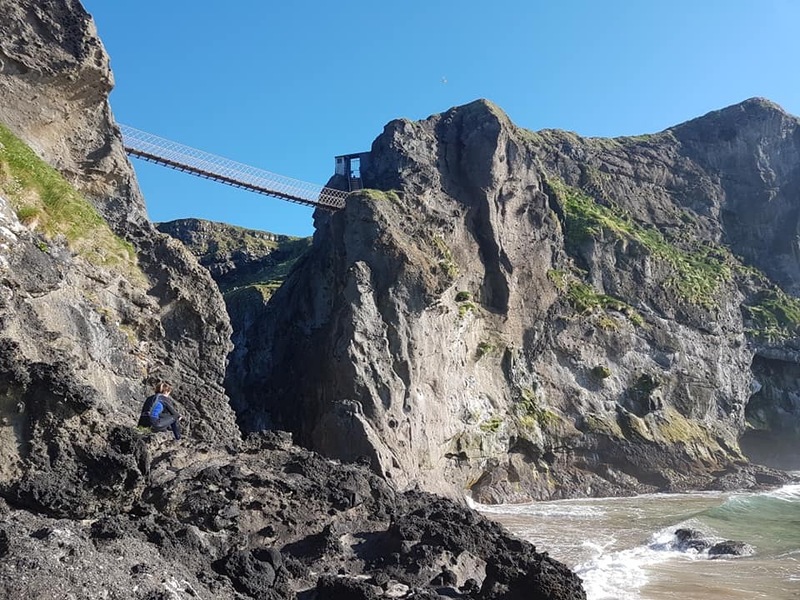 The Rope Bridge is just a 5 minute drive to the east of Ballintoy - it’ll take you an hour coming from Belfast or Derry~Londonderry and 3 hours from Dublin. First thing, you’ll need some sort of water transportation - our preferred choice being a SUP (stand up paddle board). Best to set off from Ballintoy on a calm evening/morning and paddle from there, east to the Rope Bridge. Though only 5 minutes by car, it’s about 45 minutes to an hour when paddling! It goes without saying - get some experience using a paddle board first, before venturing out into open water. You’ll need a basic bit of fitness too. Check out Magic Seaweed for surf and tide reports so you can keep an eye out and plan your adventure safely. Always make sure to tell someone when and where you’re going. Keep your life jacket on at all times and bring a phone in a waterproof case. When paddling, keep an eye out for hidden rocks on the way over and don’t go too close to the coast - keep an eye on swell and tide. Once you reach the bridge though, you can just sit and take it all in. Cracking spot just to sit and ponder - can you spot Rachel there? You can actually go and walk underneath the bridge too. Could easily spend all day around here. But again, keep an eye on the swell - we’re all too familiar with the quickly-changing weather in Northern Ireland. Also, remember it’s a long paddle back. So leave plenty of time (and energy) to get back to Ballintoy and keep in mind what was once a deep bit of water may now be shallow with the change of tide (and vice-versa). Make sure to check out the cave underneath the island too. You can actually see it on the paddle over. Just be mindful of the birds – it’s their home and they’ll dive-bomb you if feeling threatened. Best not to linger about too long! Hi, I’m Jamie and I’m from Greenisland in County Antrim. Hobbies would be paddle boarding, mountain biking, cross country running, coasteering, swimming and football. One of my favourite places is Binevenagh Mountain in County Londonderry. It’s near Mussenden Temple - around a 15min drive away. Another top place would be a small cave located along the Whiterocks Beach where I asked Rachel to marry me - it’s some spot! A truly one of a kind adventure. Slightly further afield would be the Lake District in Cumbria. Highly recommend! 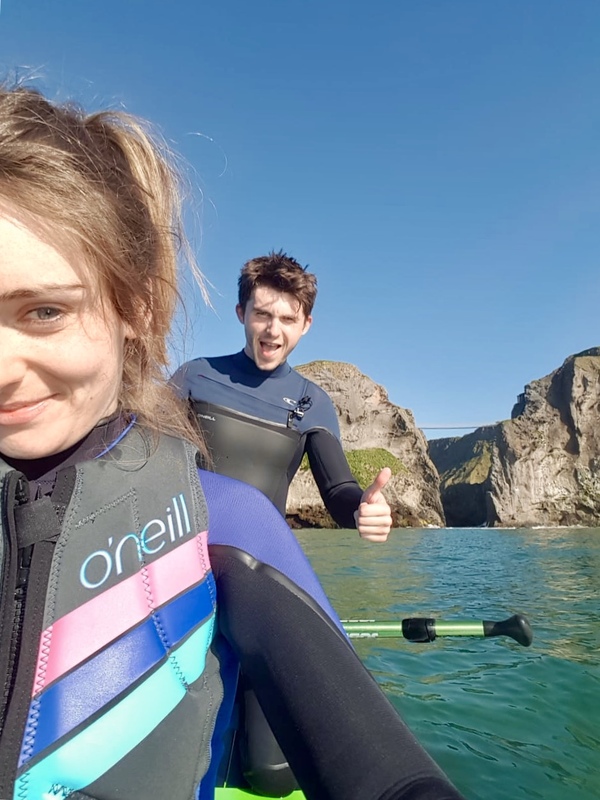 We’ve got a lot of adventures in the pipeline - next up will be in the Glens of Antrim and also SUP around Derry~Londonderry.